When I bought my scooter in 2013, I had no idea what “appropriate” motorcycle gear was. 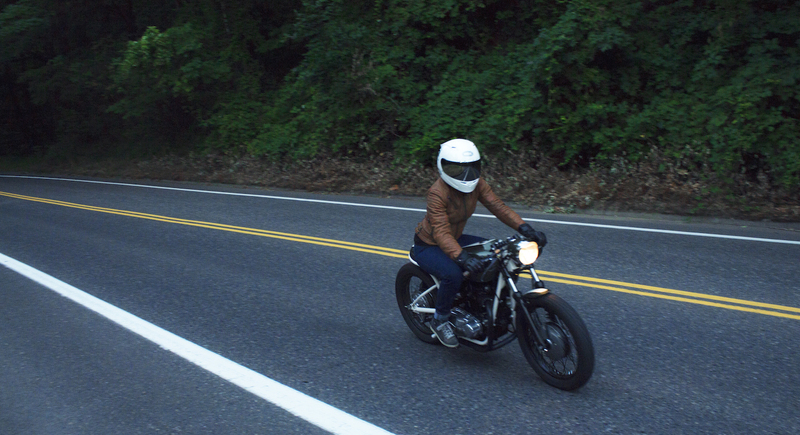 I knew gear could protect me in a crash, so I wore what the motorcycle safety class told us to wear: close-toed shoes, long pants, leather gloves, and a full-face helmet. But those close-toed shoes were Vans, the long pants were GAP skinny jeans, and the gloves were $8 fashion leather. The full-face helmet was the only thing I got right. I know now that I only thought my original gear was appropriate because I didn’t know what actual motorcycle gear was. Motorcycle gear is a difficult industry. There’s a lot of cool protective technology, but very little information is available to the public. For example, did you know you have to pay to get a copy of the CE standards? And while I believe in letting riders decide for themselves what level of protection they’re comfortable with (beyond helmets, that is), it needs to be an informed decision. If someone really wants to gear up and protect herself, she needs to know what real protection looks like. So, after two years of moto-gear geekery, I decided it was time to put together a post about what I’ve learned about “real” motorcycle gear so far. I certainly don’t have all the answers, but I plan to keep this article updated with new information as my understanding of protective motorcycle gear evolves. Just so we’re clear: this isn’t a post telling what you should and shouldn’t wear on a motorcycle. That decision is up to you. Also, this post is in no way a definitive technical reference on the absolute pinnacle of motorcycle crash protection. This post is for casual street riders who need basic, useful advice on what to look for when buying protective gear. Finally, I’m not going to talk much about helmets, since if it’s a good fit (no pressure points & squeezes your cheeks), a full-face, and DOT/SNELL approved you pretty much can’t go wrong. Plus, if you want more info, there are already several info-packed guides that can help you get the best fit possible for a helmet. I’d rather focus on the lesser-discussed gear: gloves, boots, pants and jackets. Motorcycle-friendly jackets and pants are becoming more common, but it can still be difficult to tell whether the garment will protect you in a crash, or if it was just designed to look like it will. CE certification for an entire garment just isn’t very common for jackets and pants — at least, not in the U.S. — so you have to use your best judgement. There are four main areas to consider when purchasing protective jackets or pants: armor, materials, construction, and fit. Ideal: CE-approved elbow/shoulder (for jackets) and hip/knee armor (for pants). Back and chest protectors (usually sold separately) are good to have as well. 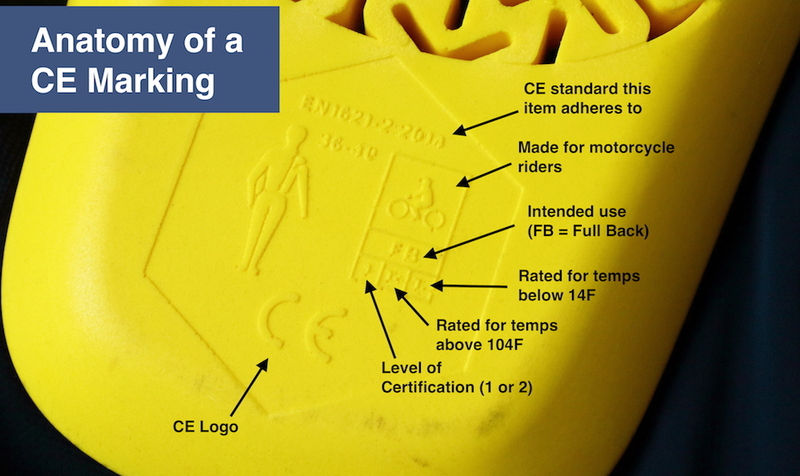 All CE-approved armor should have an imprinted CE marking — watch out for fakes! Acceptable: Some gear comes only with pockets for armor, which is fine. Just make sure you know what kind of armor will fit in those pockets. Some brands make their pockets to only fit their branded armor — which, again, is fine, if that armor is CE approved. Beware: No armor or no pockets for armor, or included armor that isn’t CE approved or has a fake CE imprint. There’s one exception to the armor rule, and that’s an armored shirt. If you, as I do, prefer to wear an armored shirt underneath your jacket, you can buy whatever abrasion-resistant jacket you like without worrying about armor. Recommendations: SAS-Tec, Knox Armour, D3O… anything with a CE certification that you find comfortable. I’ve been having a hard time finding information about abrasion-resistant materials for motorcycle wear. There are a few forums that discuss these topics, but I have yet to find anything that links to the original source material. Personally, I prefer to wear quality leather and protective single-layer fabrics, such as Dyneema denim. I’ve tried a few double-layer Kevlar garments and found them to be too bulky. The only piece of gear I wear regularly that uses Kevlar is my Black Arrow Label jacket, which uses it as additional reinforcement on the arms. Ideal: Top-grain, 1.2mm+ leather, or full coverage of an abrasion-resistant material that includes a high percentage of a brand-name “super-fiber” like Kevlar, Dyneema or Cordura. With Dyneema, around 60% Dyneema fibers is the current industry standard for a single-layer abrasion-resistant garment. I don’t know as much about Cordura, but I’ve read that 500 denier is the minimum for protection (denier being a measurement of fabric mass). Acceptable: Partial coverage of a second-layer of an abrasion-resistant super fiber. Good examples of this are jeans with a second layer of Kevlar on the rear, hips and knees, or a softer leather jacket with Kevlar-reinforced shoulders and elbows. Beware: Poor coverage of abrasion-resistant super-fibers (or none at all), thin leather, polyester-blend fabrics… And so on. Recommendations: Worse for Wear jeans, SAINT Unbreakable denim jeans, Stellar Moto jumpsuits, any quality leather motorcycle jacket. Construction: How strong are the seams? Most people pay close attention to materials and armor when talking about motorcycle gear — and rightly so. But one aspect of protective gear that frequently gets overlooked is the seams. Bad seams can be the achilles heel of otherwise protective gear: It doesn’t matter if you’re wearing the thickest, toughest leathers and level 2 armor, if the seams burst open when you hit the pavement you may as well have been riding naked. Most of the information below I swiped from a great article by Laura Smith, the maker of Worse for Wear jeans. Ideal: Strong, high-tensile nylon thread, multiple lines of stitching on each seam, and most of the seam is hidden from the outside of the garment. The more lines of stitching used, the less likely the entire seam is going to fail. And if stitching is mostly hidden, it will be less likely to fail under abrasive conditions. Acceptable: Multiple lines of stitching, unknown quality of thread. Beware: Few lines of stitching, mostly exposed, with cotton-based thread. It doesn’t matter if a jacket or pair of pants has passed all of the requirements above, if it doesn’t fit you, it won’t protect you properly. Ideal: Armor sits in the correct location while you’re sitting on a motorcycle, and does not slide around easily. Jacket and pants connect together to keep your torso from being exposed in a slide. Acceptable: Armor sits in the correct location while you’re in riding position, and does not slide around easily. Jacket and pants are well-fitted to reduce the risk of sliding up to expose your torso. Beware: Armor is easy to move away from its intended placement, gear is too loose and can easily be moved to reveal skin. Beyond protection, it’s also important that your gear is comfortable. Trust me — you might think you can overlook some slight discomfort for safety’s sake, but after a few months of wear, you’ll be more than tempted to leave your bulky-and-slightly-irritating Kevlar-lined jeans in the closet. For more tips on buying well-fitting gear, check out the GearChic blog. Joanne works at Revzilla’s showroom in Philadelphia, and has years of experience helping people choose the right gear. Gloves are the item of gear that got me into this protective-gear-nerddom thing. I estimate that 90% of the gloves sold for “motorcycle wear” lack the two basic features I find indispensable in a protective glove: hard knuckle protectors and hard palm sliders. Hard knuckle protectors are becoming more common in “street-wear” gloves, but hard palm sliders are much more difficult to find. Most “protective” gloves have soft padding on the palm, but to me this is just as bad as having no palm protection at all. If you’re wearing gloves with leather or fabric palms, and you end up sliding with your palms out on the ground, the leather will grab the asphalt and potentially twist or overextend your wrist. Hard palm sliders will help keep your hands moving across the asphalt at the same speed of your body, which reduces the likelihood of fracture. So, if you find a glove with both of those features, most likely it will be a quality glove that is made to truly protect the wearer. Ideal: CE-approved glove with hard knuckle protectors and hard palm sliders. Made from quality leather with reinforced stitching. Acceptable: Hard knuckle protectors and hard (not textile/leather) palm sliders, without CE approval, made from quality leather with reinforced stitching. Beware: Soft protectors or no extra protectors. Recommendations: Knox Armor, some versions of the Racer gloves (check for the palm sliders! ), some Dainese… just look for the palm sliders. Along with gloves, motorcycle shoes are probably the most overlooked item of gear among street riders. Unlike gloves, however, there are many CE certified options available — even if you’re looking for cafe racer style. Ideal: CE-certified boot with toe and ankle protection. Quality leather uppers with reinforced stitching. Acceptable: Grab the boot, and try to twist it or bend it. If you can bend or twist it in a way you don’t want your foot to be bent or twisted, it won’t keep your feet safe. Also make sure the boots are well-stitched and made of a durable fabric (leather is ideal). Beware: Flimsy uppers, flimsy, easily twisted soles, no toe protection, single-line seams… it would take me awhile to list it all. Recommendations: TCX boots (I wear the X-Streets regularly, and I believe all of their line are CE certified), some Dainese. And there you have it! If you have any questions or comments, or if you have any good resources about motorcycle protective gear that you’d like to share, please don’t hesitate to contact me in the comments below or by sending me an email. Shopping online for motorcycle gear is difficult, but Revzilla does it best. I’ve personally been a customer since I started riding, and I’ve always been impressed with their commitment to customer service. Remember, it’s always best to try motorcycle gear on in person. But if you can’t, Revzilla’s thorough reviews and easy returns make them a good second choice!